GABA Trex Chewables by NeuroScience helps me fall asleep!! 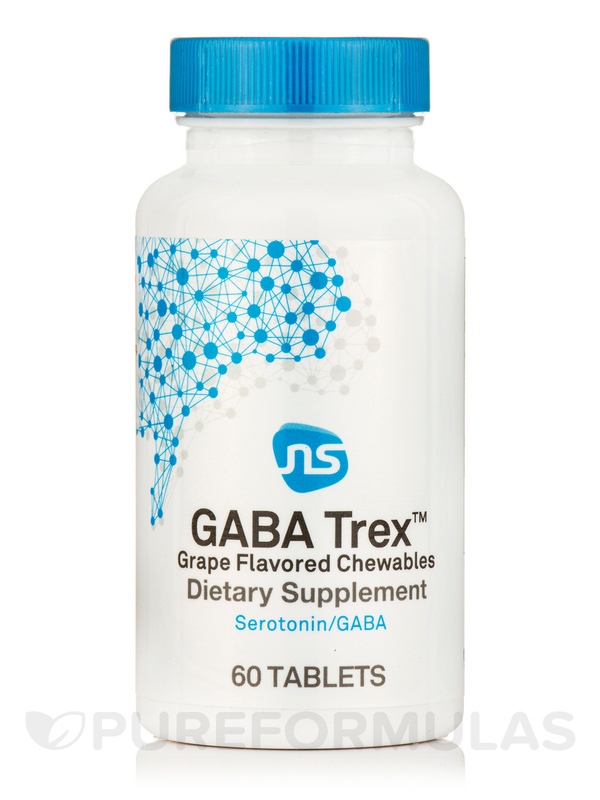 GABA Trex Chewable Tablets by NeuroScience is recommended to help with stress & anxiety by a NDR. Super fast shipping!!! GABA Trex by Neuro Science has an awesome flavor!! Recommended by my doctor for anxiety. Great quality brand! 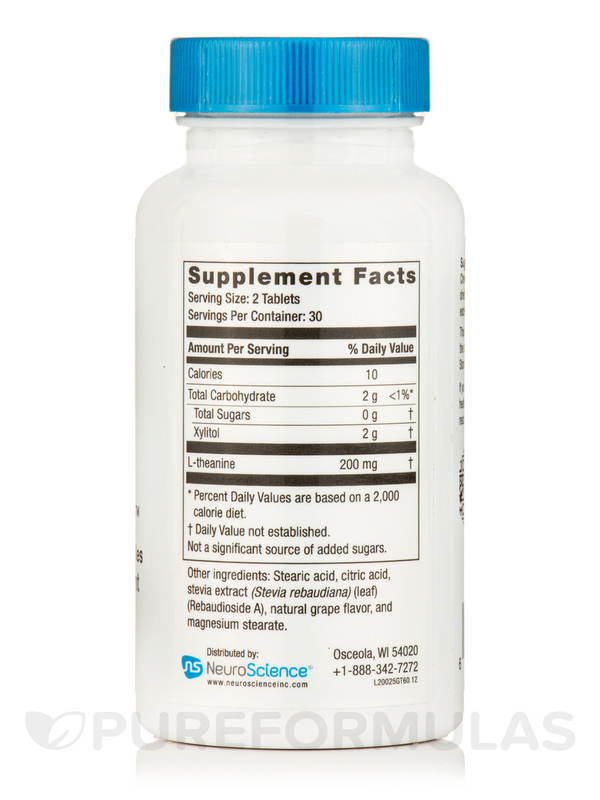 Calming Support - Inhibits glutamate activity! - L-Theanine is a glutamate receptor antagonist. - Glutamate is associated with anxiousness and stress. 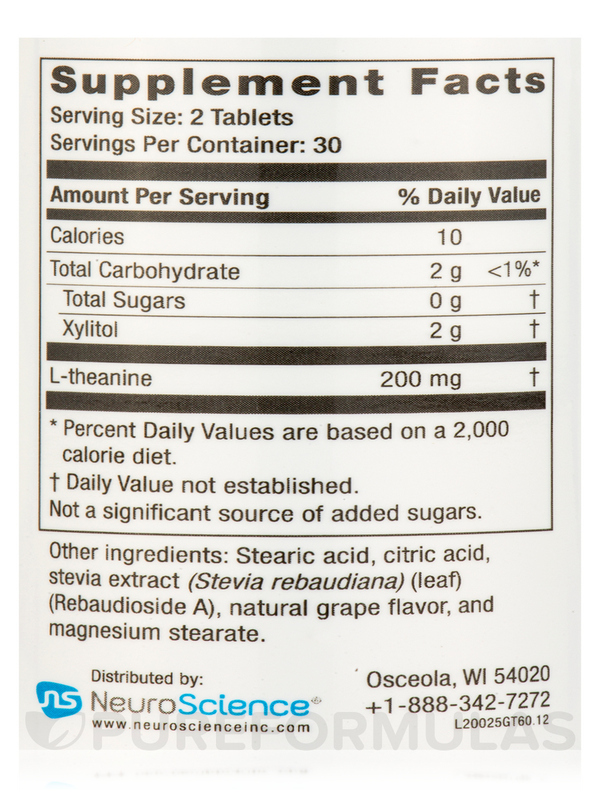 Other Ingredients: Xylitol‚ stearic acid‚ magnesium stearate‚ citric acid‚ grape flavor‚ and stevia (stevia rebaudiana) leaf extract. Not a significant source of total fat‚ calories from fat‚ saturated fat‚ cholesterol‚ sodium‚ total carbohydrate‚ dietary fiber‚ sugars‚ protein‚ Vitamin A‚ Vitamin C‚ calcium‚ and iron. 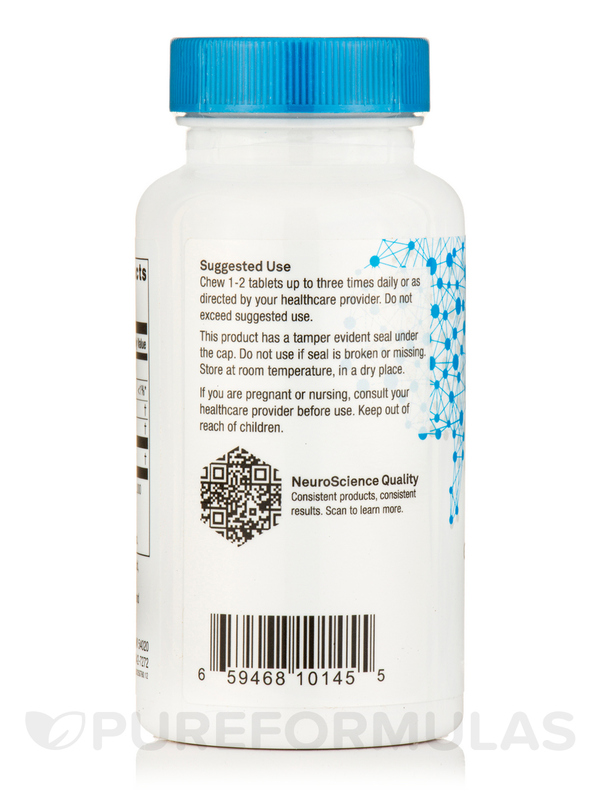 Chew 1-2 tablets up to three times daily or as directed by your healthcare practitioner. Notice: Color‚ flavor‚ and sweetness of this product may vary due to variations of the natural ingredients. I take these on a regular basis. If I didn't use GABA Trex, Grape Flavor by NeuroScience, I would only get one hour of sleep at a time during the night. When I take four before bedtime I am guaranteed a minimum of 6 hours of straight sleep. No after affects in the morning. I have learned to keep at least three bottles on hand at all times to make sure not to run out! I get a great nights sleep of at least 6 hours with a dose of four very flavorful little pills. They are kinda of pricey but well worth the nights of uninterrupted sleep. My daughter was recently tested by her doctor. Her levels were extremely high. Her recommend dosage of GABE Trex by NeuroScience was 2 tablets twice a day. I can definitely tell a difference in her. She seems to be less anxious. Her fears of certain things (bugs,dog,ants,etc..) she is still fearful, but much, much better than before. She doesn't mind the grape taste at all. Her focus in school is still an issue, but we will work on that too. Chewable. Helps my daughters anxiety. I wish it came in a bigger bottle, with 120 + tablets. I take two of GABA Trex Chewable by Neuro Science it is a wonderful tasting tablets before bed. They allow me to sleep comfortably. I prefer these instead of prescribed sleeping pills, plus no side effects the next day. The product is great b/c you can take it as needed when anxious or overly stressed. Not bad tasting either. Both my daughter &amp; I take it &amp; it helps chill us out. I ordered GABA Trex Dissolvable Tablets at the recommendation of my medical doctor and Pureformulas.com had it at the best price. I am on a very tight budget so I was very happy to find all of my products in one place where the shipping was also affordable. Nor can I recommend a product which is so difficult to get. It works well for me when I can get it! Its been on back order for MONTHS! 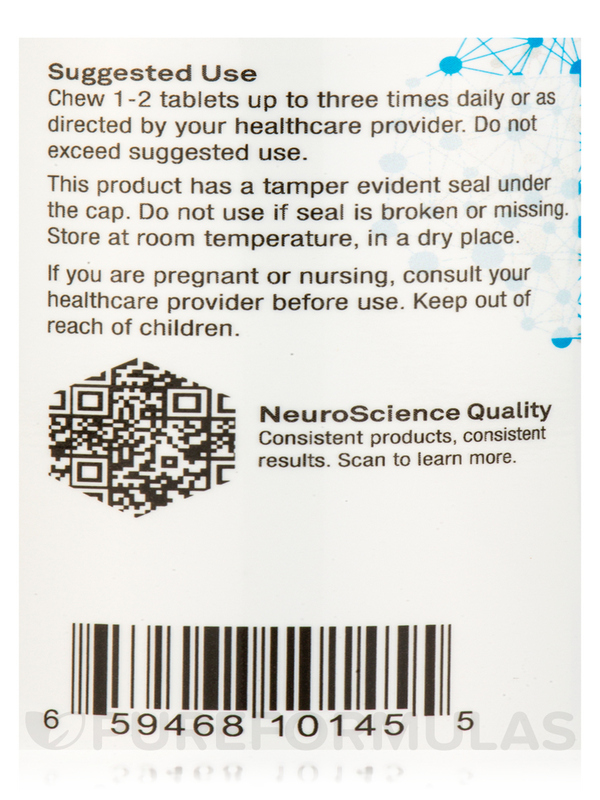 We have been using GABA Trex by NeuroScience since spring of 2011 after having our then-3-year-old daughter tested by a nutritionist and finding her neurotransmitter levels were high and vitamin & mineral levels were low. We began a regimen of vitamins minerals and Endo Trex to help re-balance her system. In conjunction with these supplements we changed her diet to eliminate all gluten casein soy peanuts and other foods that tests showed she was allergic to and started a structured daily routine which included a Montessori program at the local school. Her 1-3 hour meltdowns went from as many as 7-14 a week (and sometimes several a DAY) to just an occasional one of maybe 30 minutes at most. That is until they discontinued the Citrus Flavor GABA Trex. In the past couple months weve tried 2 other products which the first didnt help at all and the second is about twice the cost of Endo Trex! In desperation I ordered a bottle of Root Beer Endo Trex to try again. She despised & totally refused it back when she was 3 but I just wondered if we called it "Soda" instead of Root Bear perhaps she could take it for us. It WORKED and she is back on GABA Trex!!! For US this is a proven product! It has helped our now-5-yr-old to help control her emotions so she doesnt have as many emotional meltdowns as she once had! My last order of gabatrex was a very small pill. The pill is three times larger in the order I just received. I believe they both contain 100mg of L-theanine. Just wondering why so big? Thank you for your question, Rachel. The manufacturer has advised us that the pill has not changed. Perhaps it was a similar product. Please call us at 800-383-6008 if you have any concerns.